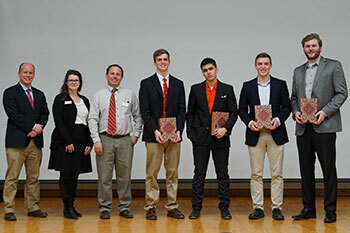 At the beginning of February, Joey Lenkey ’19 was helping curate the speakers for TEDx at Wabash College—and two weeks later it showed during his winning speech at this year’s Baldwin Oratorical Contest. “I wanted it to be like a TED talk, where the audience leaves the event thinking in a whole new way, as opposed to leaving with a simple list of things to do,” Lenkey says. According to the event judges, he did just that. Their ideas didn’t fall on deaf ears. The judges for the contest this year were three administrators with power to change the College’s path: Kendra Cooks, Chief Financial Officer and Treasurer; Scott Feller, Dean of the College; and Marc Welch, Associate Dean of Students. Lenkey’s outside-the-box thinking impressed the judges. His speech, “How Could Data Improve Our Diminishing Social Life?” tied his experiences tracking patient outcomes at an internship with IU Health to the potential for tracking data on the College’s social life. Ian Gale ’22 and Benjamin Manahan ’21 both advocated for new approaches to mental health on campus and came in second and third place, respectively. In fourth place was Dalton Vachon ’19, who explored options for a new student union on campus. In its 145th year, the Wabash College Baldwin Oratorical Contest began in 1873 as a gift from the late D.P. Baldwin, a longtime trustee of the College, who endowed an award to be given each year to the Wabash students who "compose and pronounce the best orations." Just as they did in 1873, the top three finalists received a cash award and the complete works of William Shakespeare.